Papaver belongs to the Papaveracea family. This plant family includes200 varieties, classified in 26 genera of which Papaver accounts 100 varieties. Papaver is native in most of the mild areas of Europe and Asia, but also in countries which are known for their severe Winters such as West-North America. Some varieties are quite rare and exceptional ones. Papaver dahlianum, Svalbard Poppy, for example, is a variety which is native in East-Greenland; North of Norway and Spitzbergen. Dahlianum derives from Mr. Fr. O. Dahl, born in 1856in Holstein, Germany. He passed away in 1929. He was a zoologist anda custodian at the Zoological Museum of Berlin. Another rare variety is Papaver radicatum, Rooted Poppy, derived from the Latin word radicäre…radix…radicis which means; firmly rooted; having strong roots. It is a creeping variety. Papaver radicatum is native in rocky polar areas; North of Canada; Greenland; Iceland; North of Scandinavia; Nova Zembla and the North of Siberia. It is still not fully clear where the name Papaver itself derives from, though the Romans in the ClassicalAntiquities(ancient times), the poppy already specified with the name Papaver. The name Papaver might refer to the Keltic word papapap which means porridge or children pap. In those days the sap ofPapaver somniferum, somniferum (somnus and ferre) was put into the porridge of children to take care that they fell asleep soon. Somniferum actually means: bringing sleep or making asleep. It was used as a sleep-inducing drug. Others say that the word Papaver has been composed of the words papa and verum(real) which should mean: pure pap. The name also could be derived from the word parare that is: to eat. It is certain that already in 1500 BC(before Christ) the Egyptians put Papaver seeds in their bake and that’s why the Arab’s has spread the Papaver and their use widely, even to China. Plinius the Younger, who lived from 24 – 79 AD (after Christ) described how the Romans spread their loves of bread with Papaver seeds before they were put into the oven and the Jews cover their Sabbath-bread with poppy-seed as a symbol of the abundance of manna in the desert. This kind of poppy-seed however, does not contain the sleep-inducing drug. In case of Papaver somniferum(Opium Poppy) it is obvious that the different uses could become a blessing or a curse. The seed of this variety has a histogenesis which is rich of oil, sometimes up to 50%. This kind of Papaver-oil is used for the production of expensive paint varieties. The skin of the fruit also contains latex which becomes hard as soon as it is touched by fresh air. It is called raw opium and contains Codeine and Morphine. They are used as an analgesic(painkiller).The therapeutic effect(medical) is known since ages. In ancient times, it was not known that Opium could be isolated from the unripe Papaver fruits. It was not before 1806 that the Chemist Friedrich Sertürner successfully isolated Morphine. He named it after Morpheus, the Greece God of sleep. Both the Alkaloids, however, also are used for the illegal production of heroin which has caused a world-wide curse because of its addictive use. In the scope of this article it is no use to describe all the species and that’s why I confine to the main, well-known species. The annual Poppy, Papaver argemone, Long Pricklyhead Poppy, from Greece argémon which means: white spot on the hornea. The white latex(vegetable milk) of this variety is used as a medicine for eye deceases. This variety resembles Papaver dubium(Blindeyes)…dubium which means doubtful; questionable; dubious and Papaver rhoeas(Greece for Papaver variety) Common names: Corn Poppy; Flanders Poppy; Shirly Poppy. Papaver rhoeas is the most well-known one. It is native all over Europe, the mild parts of Asia and North Africa while the plant is naturalized in North America. It is widely spread because of the grain-grow…Corn Poppy. This Poppy became famous because of the FIRST WORLD WAR. It was found in such huge quantities on the Belgium battlefield grounds that this poppy played a big role in the war poetry of the landscape. The commemoration of the end of the First World War is therefore still named: Poppy Day. Papaver alboroseum which means: albus…white; roséus…pinkish red = white with pink and red. Common name is Alaska Papaver or Pale Poppy. It is a dwarf variety 10cm height. Botanist believe that this variety belongs to the group of Alp Papaverslike Papaver alpino. Papaver atlanticum; Atlas Poppy; Moroccan Poppy. It was first found on the Atlas Mountains in North-WestAfrica, south from Gibraltar on which ,according to the legend, the heaven rested upon. Though Papaver atlanticum is said to be a perennial one, it mostly will not become older than 3 or 4 years. The look-alike Papaver latericium…means: stony-red; and Papaver pilosum…means hairy as well as Papaver rupifragum…means: splitting rock, all have the same characteristics. All the varieties are hairy, having orange or red colours and the same life-time(circle). Papaver nudicaule…nudicaule derives from the Latin words nudus and caulis which means bare and stem—having no leaves on the stem. Though the common name is Iceland Poppy or Icelandic Poppy, the variety actually is native in the (sub) arctic mountains of Asia and North-America and an umbrella(collective) name for a group of Papaver. The different varieties hardly can be distinguished as they are cultivated since 1730. Ever since many varieties have been developed, also by cross-breeding. The diversity of colours in single and double flowering varieties is immense. Papaver nudicaule mostly is offered as a two-year old plant, produced from seeds. The synonym for Papaver orientale is Papaver bracteatum from bractëa which means: bract or clear bracts. Both the Papaver species easily cross-pollinate and both have been used by the breeders in the past for cross pollination and hybridization so often that botanist hardly could say what is what. It seems that Papaver orientale dominates. Both the species are native in Iran; Armenia and the Kaukasus. Papaver orientale is the main grown and the best in trade of all Papavers. The very beginning of hybridization of Papaver orientale goes back to 1730AD. French nurseryman started breeding and hundreds of varieties have spring from their work ever since. The colourful world of Papaver has appealed and still appeals to the imagination of breeders. Those are constantly trying to approve the range of colours; to get stronger, sturdy stems; to breed tall, longer lasting varieties which are suitable for the production of fresh flowers as well as short-stem varieties which could be offered, not as a garden plant only but as a pot-plant and as an indoor plant too. It takes yearsand thus a lot of patience, to get new varieties, having the characteristics as stipulated above and only fanatic breeders and Papaver lovers can summon the courage to become disappointed again…and again…and again until they finally find a variety which meet their requirements, which actually are the requirements of the modern landscapers; garden-centres and flower producers. 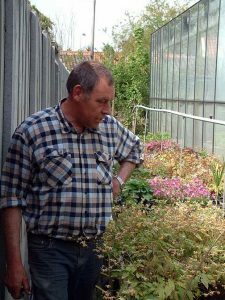 In Holland there are two Papaver breeders, who have left their mark on the availability of widely offered new varieties. Both have a good reputation among hardy herbaceous perennial breeders. Eleonore never would have thought that she ever in her life would run a nursery.Eleonore was not a nurserywoman by birth though her father was an enthusiastic hobby-gardener. She was brought up in the Dutch town Rotterdam and became a well trained secretary in her home town. Nearly 30 years ago she visited a public garden in the South-West Dutch province of Zeeland and to her great surprise she could not buy any plant there. A few thousand of visitors in one single week…and no plants for sale??? This must be a gap in the market, she convinced herself. She discussed the matter in question with the owners of the garden and offered to produce some of the plants which had taken her special attention and sell those plants to the visitors. Among her favourites was Papaver orientale…the Poppy. 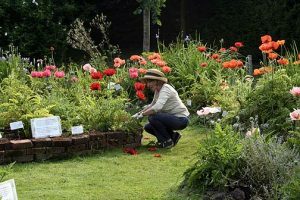 She felt in love with this flamboyant and elegant very early flowering hardy herbaceous perennial plant and decided to create her own range of Poppies. 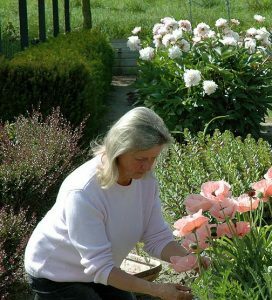 She moved from Rotterdam to the Province of Zeeland and started her own nursery and show-garden. Nowadays she is famous all over the world. To get even better results in breeding Papaver, she moved her nursery to France where the climate is warmer and therefore better for the production of Papaver seeds. Many owners of leading well-known nurseries have found the way to her nursery, looking for her latest creations. Eleonore, in the meantime has named over 20 varieties . Her love for France decided her to give a part of her breeds French names, such as: Arc de Triomphe; Montmartre; Moulin Rouge; Louvre; Sorbonne. Besides the Papaver, Eleonore is also a passionate breeder of Achillea. In the “green heart” of Holland, in the “middle of nowhere”, the nursery of Herbert Oudshoorn, being born and bred in the small village Rijpwetering, is located. The nursery itself, hardly can be found as it is tucked away behind tall trees. Whole the nursery is surrounded by it, but once entered, it is obvious that you are on the spot of a nursery-man of heart and soul; a talented breeder and grower, having so-called “green fingers”. Herbert has a large number of new varieties to his name of which some are extremely well demanded ones, such as; the very dark red Astrantia Venice; Eupatorium dwarf forms; Verbascum Pixie series and a complete new line of firm and compact Sedums of which Sedum Xenox got an award at Wisley Gardens, United Kingdom after a three years testing period. Coming back to Papaver, Herbert has been infected by the Papaver virus many years ago and once this kind of virus attacks a breeder, never in his live he can get rid of it. Herbert likes tall Papavers when the stems are firm and sturdy enough….and this only is the case when the plant does not fall down if a bike is parked against the stem, Herbert says!!! The bright red variety King Kong is a good example. But actually, Herbert is focussed on compact, short and thick stem Papavers in his breeding program. The flowers must be very big and the leaves must remain fresh and green when the Papaver is blooming. It is well known that the leaves of most of the older Papaver varieties get yellowish and rusty, which causes a negative contrast between the fresh colour of the flower and the leaves. Undoubtedly, Herbert became famous because of his double-flowering ruffled Papaver varieties: Fancy Feathers; Miss Piggy and Ruffled Patty. Some other of his top varieties are: Baby Kiss; Double Pleasure; Little Candy Floss; Mandarin; Pagode; Papillon and Scarlet O’Hara. Herbert still continues, breeding Papaver and we may expect an extended range of the ruffled ones and the double flowering ruffled ones in the years to come. In Cheriton Nr Alresford Hampshire between Winchester and Petersfield, United Kingdom,you may find Water Meadow Nursery & Herb Farm owned by Roy & Sandy Worth. The nursery has been established in 1991, after their return from Asia, where Roy was working in Sales and Marketing. 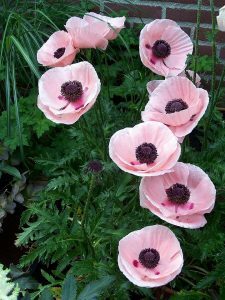 the petals of the Super Poppy are much thicker and glossy and though some cultivars do fade, they fade more beautifully. the flowers of a Super Poppy last longer, sometimes up to 18 days before it drops the petals. A Super Poppy only will be introduced after being tested for several years and has proven that it is worth to carry the name of Super Poppy. On May the 19th 2008 a brand new variety of the Super Poppies will make its debut on the famous Chelsea Flower Show. The variety is called: THE FALKLANDS. The variety has strong stems; thick glossy petals and re-blooms in August. It has a clear; clean red colour, having tapered serrated edges, almost looking war torn in a most beautiful way, Sandy says. The reason why this variety is called THE FALKLANDS and will be introduced in 2008 is, because 2008 marks the 25thanniversary of the Falklands conflict, so Super Poppy THE FALKLANDS commemorates the 25th anniversary of the said conflict. The variety in question was planted,November 2007 in a special MemorialGarden of the San CarlosCemetery where the troops, who lost their lives during this conflict, have been buried. Nearly 40 years have been passed since James De Welt decided to take the trouble to create a Super Poppy. Garden lovers must be grateful to James for a life long labour on breeding this Super Papaver and we also should be thankful to Sandy Worth for carrying on James work, making all the garden lovers and, in particular the Papavers lovers and collectors happy , by introducing new varieties and colours of the Super Poppy.